Puerto Vallarta's malecon, a seawall walkway in downtown Puerto Vallarta, is a great stroll. Local families and tourists mingle, especially on Sundays, in front of street stands selling roasted corn or trinkets, street performers, and fantastic sculptures by artists like Sergio Bustamante. Check out a few photos, some taken in the strange, other world light seen before a hurricane, of Puerto Vallarta's malecon. Alejandro Colunga's Rotunda of the Sea - families walk the malecon on Sundays, watching street performers and the sunset. More below. Alejandro Colunga's Rotunda of the Sea provides a pleasant place for parents to watch the sunset while kids muffin on a summer Sunday afternoon in Puerto Vallarta. The fantastic sculptures are among the most user-friendly and kinda crazy art on the sea walk along Banderas Bay. Alejandro Colunga's Rotunda of the Sea provides a pleasant place to watch an incredible sunset in the wowser light of Puerto Vallarta's Banderas Bay. A stroll on the malecon as the sun dips toward the sea is something else. Nature As Mother, Adrian Reynoso -- a spiral wave on a snail evocative of the circle of life. Just one of the absolutely awesome art pieces on Puerto Valarta's malecon. The photo was taken in the strange light of an approaching hurricane. Click numbers in the grey bar above or below to see more. Sergio Bustamante's "In Search of Reason" sculpture is definitely thought provoking, which is what we ask from art. A Wrinkle in Time, anyone? A street vendor peddles wares under the palm trees on Puerto Vallarta's malecon; nearbby is the great Rotunda of the Sea art. Puerto Vallarta's malecon offers absolutely awesome art down the length of the sea wall walk... click on the numbers in the grey toolbar above or below to see more. 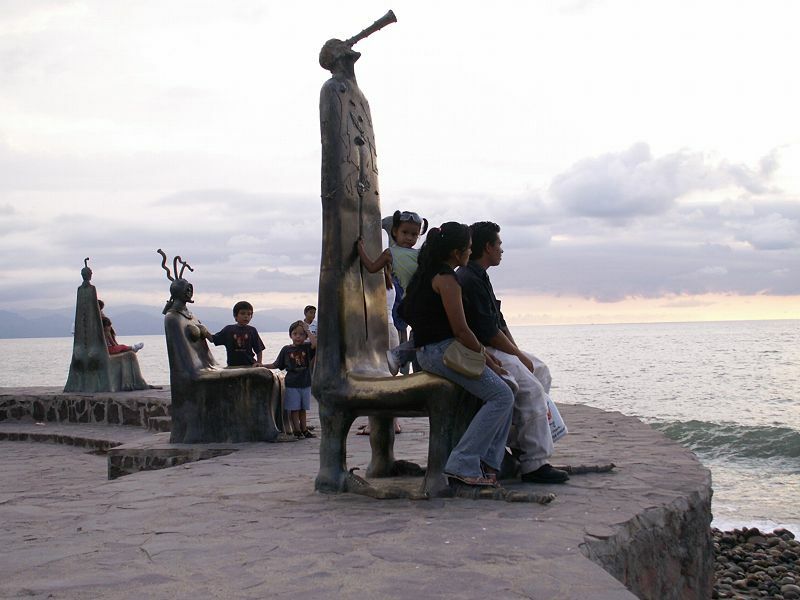 Sunday summer sunsets are a terrific time to see families taking in the sunset on Puerto Vallarta's malecon. El Rotunda of the Sea is across the street from Las Palomas, where you can scarf some great fish tacos and watch the action on tghe maleecon with the aid of a margarita. Click on numbers above and below in the grey bars to see more of Puerto Vallarta's malecon, a seaside walkway downtown. The sculpture of a seahorse in Puerto Vallarta's malecon, created by Rafel Zamarripa and called Caballeo del Mar, has become a symbol of the city. Hurricane John powered past us en route to Baja Sur 36 hours after this shot was snapped on Puerto Vallarta's malecon (seaside walkway). The Category 3 storm favored us with fierce humidity and some epic surf, but just a bit of wind and rain and some wild light in the sunset, as seen in this shot. Wow. Ujena's Bikini Jam takes place over Labor Day in Puerto Vallarta, and hurricanes may always be part of the excitement at this annual event. Puerto Vallarta's protected position on beautiful Banderas Bay keeps the city safe from most windy weather happening out in the open Pacific, and Hurricane John's threat in 2006 was no exception. Bikini models, photographers, and Bikini Jam spectators spent the evening at Senor Frog's while the weather beat went on far out to sea. Street performer puts it on in Puerto Vallarta's malecon. This bikini model is part of the bikini contest, photography contest and all around good times during Ujena's annual Bikini Jam in Puerto Vallarta.